I’m not often a fan of fiction. I recently finished Philip Pullman’s His Dark Materials trilogy and had a mixed reaction. But I find a lot to like in Pullman’s underlying philosophy. And the more I read of others’ negative reactions to the trilogy, the more I find myself drawn to its central message. Organized religion finds lots not to like about Pullman’s books, and they’re absolutely right. They should be threatened by these books, because they strike right at the heart of everything that’s wrong with much of religious philosophy. I became very interested in Pullman’s vivid description of what it is like to have one’s daemon “severed”, and in reading more about it I came across this blog. “In a sense we are all severed children, cut off from God. The Incarnation has made it possible for us to begin to re-establish the connection. The choice is there, for everyone and for all time. The mere knowledge that this is possible, and the faith to embark on the process, is enough to undo many of the effects of the severing; it accounts for the serenity which is one of the things we always sense in someone who seems to be far advanced along the path. Speaking as a lost, empty, half-dead creature (who is right now looking at a beautiful blue sky and wondering how anything can be so perfect), all I can say to the author is, “Can you hear yourself? Can you hear the arrogance and presumption?” But that’s not really what I want to write about. What I want to write about is the twisting of concepts that I’ve found in my own limited experience to be so representative of all that religion tries to do. In His Dark Materials, the idea of the daemon is you. Not some otherworldly spirit, not some generous gift from somewhere else. It is you. Your hopes, dreams, fears, loves, aspirations, the thing that makes you yourself and not someone else. The loss of your daemon is the loss of your identity. And this is what religion asks. Religion (my religion, anyway, the religion I grew up with) tells us that what’s good is actually bad. If you love your child more than God, you’re a sinner. God might test you by ordering you to kill that child. Abraham loved God more than Isaac, and was duly rewarded. I (and you, too, and every good and decent person I know, I suspect) would have failed that test, and been punished by God. Religion tells us that knowledge is bad. Eve chose knowledge, instead of eternal infancy and ignorance, and she and Adam were punished by God. Read Genesis 3:22. God didn’t want their eyes opened. God wanted to keep them ignorant forever. Religion tells us that doubt is bad. Thomas demanded proof that Jesus had risen from the dead. Jesus gave him proof, then chided him, praising those who believed without proof. Religion tells us to submit, to give ourselves to God, to abandon worldly things. The world is sinful, no good, impure. Turn your back on it, and you’ll be rewarded. Later. Look carefully at this list. Don’t love anything, even your own children, more than God. Don’t seek knowledge. Don’t doubt. Don’t enjoy life. In other words, be severed. In His Dark Materials the Church decided to try severing children to save them from Original Sin. In our world, religion does the same thing, metaphorically. Then (and here’s the really clever trick) religion tries to give you this false daemon they call God. I deny no such thing. I say the air is fresh and wholesome. Where the author sees a cave-in, I see life: messy, imperfect, beautiful life. We start off whole, we humans. We start off with brains and eyes and ears to take in all that is around us, starstuff contemplating the stars. We start off (hopefully) with parents and community who give us the tools the learn, the freedom to make mistakes, and the support to recover from those mistakes. We start off with choices. Think of the power in that! Is there any greater freedom than the freedom to choose? In our world we can’t see our daemons. But they’re there. We all have them, and we know them well. They’re the voice you hear as you stand in the shower, contemplating your day. They’re the joy you feel on a beautiful blue-sky day. They’re the tears that well up at the end of a Hallmark commercial. They’re the whisper in your head when you hear a ridiculous story, saying “come on!” You know your daemon. Your daemon is YOU! Don’t let them sever your daemon. You have the power to choose. Use it. My daughter Caroline sang the lead in her school concert last night. My wife and I were so scared for her, literally shaking in her seats, but she was brilliant. How a seven-year-old ever got that brave I’ll never know. I would have curled up under the bleachers at that age. They sang “The Rainbow Connection.” I love the optimism of the song, its conviction that the world is a magical place. It’s easy to read into the song an indictment of science as this dull, soul-crushing set of facts that takes the mystery out of everything, leaving it flat and dead. But that’s not how I see the song or science. Understanding rainbows reveals the real magic they possess, the deep and beautiful mysteries they contain. Everything in the universe that makes its own light also makes a rainbow. Usually we can’t see the rainbow, because of an amazing thing: all the colors of light travel at exactly the same speed. Why? We’ll come to that. Using special equipment like prisms or diffraction gratings, we can reveal the hidden, secret rainbow in all light beams. 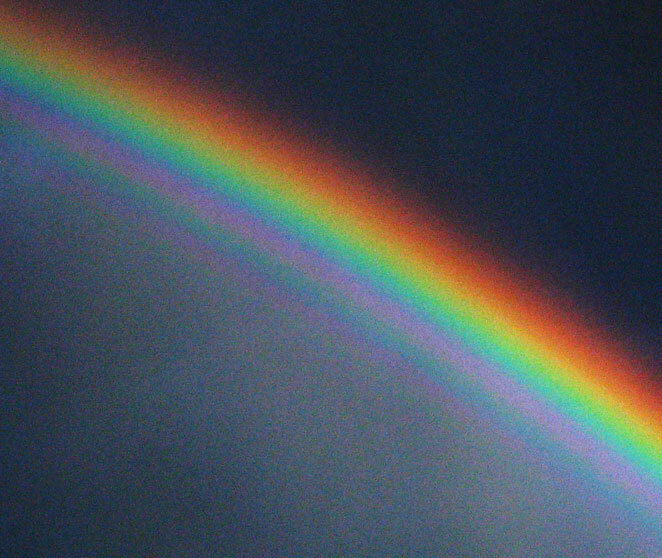 Sometimes we discover that the rainbow is made of just one color. Laser beams and sodium vapor lamps are like this, and tell us something deep about how that light is made. Other times there are just a few colors in the light beam. But most things, things that glow because they’re hot, things like incandescent light bulbs, campfires, and stars, give off every color of the rainbow. We see stars because they’re so hot. They blast space with radiation, and a tiny bit of it reaches us, after traveling for tens, hundreds, thousands, even millions of years. Imagine that! Light that was formed before you were even born traveled through empty space, day after day after day, as you grew up. Then, one evening, you happened to glance into the sky and catch that little bit of light in your eye. If you send that little bit of light through a diffraction grating before it reaches your eye, you discover something incredible. The light reveals the composition of the star that made it. What are stars made of? The same stuff you’re made of. In fact, the stuff you’re made of was made, originally, up there, in the stars. You are starstuff contemplating the stars. That’s only one of the things we learn by understanding rainbows. Well, I’m their writer monkey, so OK. But they miss the entire point! Electromagnetic waves and light are no different, except for one thing. Our eyes react to light. To remove that connection is to take away one of the great unifications of science. Visible light is electromagnetic radiation we can see. Electromagnetic radiation is invisible light! And some of that invisible light tells an incredible story. Watch the best thing on television. That would be the channel with no signal. You get nothing but static – noise. About 1 of every 100 bits of that static is the world’s oldest fossil. It’s radiation from the great fireball that began the universe. What’s on TV tonight? The Big Bang! By studying this invisible light (there, I said it, nya nya! ), scientists uncovered one of the most deep and meaningful things we’ve ever learned. The universe has a birthday. It wasn’t always here. It began. OK, that’s two. One more for good measure? Why can’t we ordinarily see the rainbows in light? Why do we need things like raindrops or spectrum glasses to break up the colors? As I said, that’s because under ordinary conditions all colors of light move at the same speed. But why? It’s because light (visible and invisible light) is something the universe does. Over a hundred years ago, a scientist named James Clerk Maxwell was playing around with the equations of electricity and the equations of magnetism. He knew there were strange connections between these two phenomena, but neither he nor anyone else understood what those connections were. Maxwell noticed a missing symmetry in one of the equations. When he added that symmetry in, something amazing happened. Maxwell recognized that he’d created a wave that spread out from the electric and magnetic fields. This wave carried the electric and magnetic fields through space. Its properties depended solely on the way empty space reacts to electric charges and magnetic fields. Change the properties of space, and you change the wave. But here’s the magical part. Maxwell’s equations showed that the wave he’d just created moved with a single, unique speed. The speed didn’t depend on the size of the electric or magnetic fields, didn’t depend on how they moved or changed, didn’t depend on anything other than the properties of space itself. The speed of the wave was precisely the measured speed of light. Maxwell had just shown that light, that mysterious substance that lets us see the ocean meet the sky, the Sun coming up over the horizon, or a seven-year-old girl singing before a crowd, is nothing more (and nothing less!) than wiggling electric and magnetic fields. Hold up a magnet and shake it – you’ve just created (invisible) light. Rub a balloon on your head. More invisible light. Light, the weaver of rainbows visible and invisible, is something the universe does. And that’s The Rainbow Connection.